This thing. It will be discussed. One of the genuine perks about being a Michigan blogger, other than writing for all you fine folks, is sometimes we get...stuff. 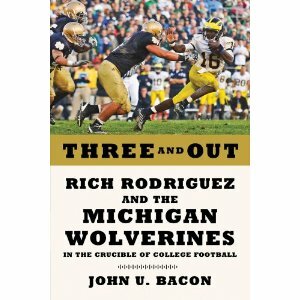 I must admit, when I first heard about John U. Bacon's book, Three and Out – which chronicles a blow-by-blow account of the three most tumultuous years in recent Michigan Football memory, I knew it would be a must-read for any Wolverine fan. How could it not? Bacon...Rodriguez...book. Do the math. Luckily enough, I was able to get my hands on a pre-release copy. You can pre-order yours here. It lands on the 25th. Let me just say, it's long. 438 pages to be exact. But in those pages is a very detailed depiction of the three years Rich Rodriguez spent as Michigan's head coach. Bacon had unfettered access to Rodriguez. And he used it well. Since it arrived on Tuesday, I haven't been able to put it down...and I'm not what you would call, a book guy. I'm not through it yet – this week has been a test in time management for me personally, but I'm close enough to be able to call this book a true achievement. John poured three years of his life into these pages, and boy, was it worth it. Any Michigan fan worth their salt knows who John U. Bacon is. Maybe from his countless appearances in such Big Ten Network shows such as the recent "Icons" series, or his weekly radio show on WTKA. Or maybe you know him from his previous book, Bo's Lasting Lessons. Either way, the UofM alum and teacher, who won the 2009 Golden Apple Award given by the student's to Michigan's best teacher, will be a name any sports fan will recognize after this book hits. Brian Cook from MGoBlog, who is mentioned frequently in the book, has posted a series of Q and A's done with the book's author. Check them out. Part 1, Part 2, and Part 3. UMGoBlue has some early thoughts. And Greg from MVictors also chimed in with his view from the clans – which makes a lot more sense now that I've digested most of the book. Without going into too much depth, this book is going to be talked about. A lot. You're going to need to maybe schedule some extra time with your therapist when you're done. 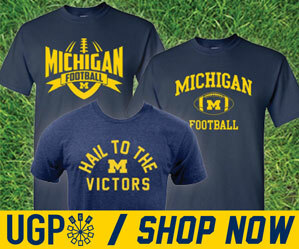 I'll just say that I blogged pretty heavily before, through and after the Rich Rod era at Michigan. I thought I had, at least a decent gauge on what was happening. But above the level of access I had to the program during this time, there was a ton of stuff going on (putting it nicely). To put it simply, as Bacon would – Boy, I had no idea. I'm really eager for this book release, so I can talk about it more. I need to talk about this. But I have a feeling there are a few people, people you all know quite well, who aren't as excited as I am. If you haven't already, pre-order your copy now. Right Now!